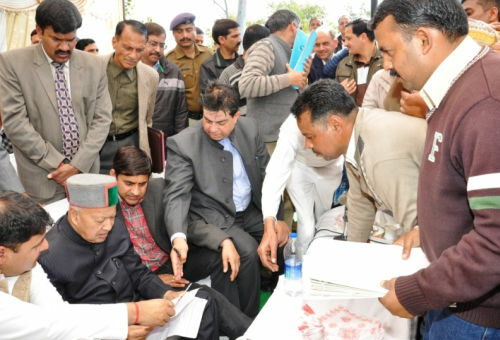 Chief Minister Virbhadra Singh today listened to the public grievances on 2nd day of his winter sojourn in Kangra district. 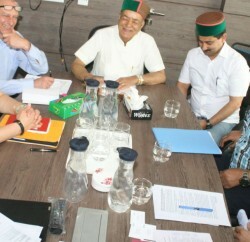 A delegation of Chanmari village led by Kewal Singh Pathania, Vice Chairman of HRTC met the Chief Minister at Dharamshala and urged him for construction of road to the Chanmari village through the land which was under the possession of Army. He directed the Deputy Commissioner to visit Chanmari village and settle the dispute between Army and villagers for paving the way for construction of road. Chief Minister was given warm welcome at Gaggal, Mataur and Ichhi villages. Local MLA Pawan Kajal honoured the Chief Minister and Sudhir Sharma, Urban Development Minister at Ichhi. The delegation of Panchayat Takniki Sahayaks Sangh urged the Chief Minister to regularise the services of Technical Assistants who had completed 10 years of services and framing policy for those who had completed more than five years of services. The delegation Tiyara village requested the Chief Minister for tubewell and upgradation of veterinary dispensary of the village. 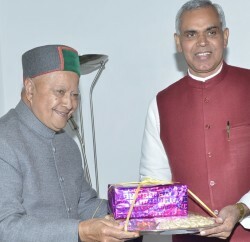 Former MLA and Mandal President of Congress Party Surender Kaku while welcoming the Chief Minister said that Himachal Pradesh would scale new heights of development and progress under the dynamic leadership of Virbhadra Singh. Many other delegations including Krishak Mitra Sangh, Private Bus Operators Association, Kangra Unit of NGO Federation, PTA, Nursing Students Association of Tanda Medical College also met the Chief Minister regarding their demands. 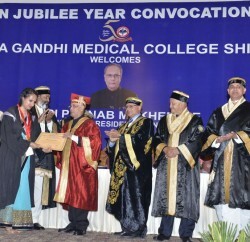 The Chief Minister assured that their demands would be considered sympathetically. Sanjay Rattan, MLA, Suman Verma, President, Kangra Nagar Parishad and District Congress, C. Palrasu, Deputy Commissioner and other prominent people and senior officers were present on the occasion.